‘Gorillas in the mist’ was how we came to refer to ourselves on our visit to the Vumba Mountains. Vumba (also spelt Bvumba) literally means “mist” in Manyika, and we can testify that the name is spot on. Patches where the mist lifted revealed that Manicaland’s mountainous highlands consist of verdant hillsides, moss-clad granite domes and deep ravines. The famous Circular Drive around the perimeter, about 70km long, took almost four hours to complete, for in places we could hardly see anything, neither alongside nor ahead. Ominous and truly awesome, the dark forests rising above Burma Valley to the south and Essex Valley to the northeast are not lacking in atmosphere. This is Tolkien country rather than dry and dusty Africa, and I wasn’t surprised to learn that the area is still used for healing, rainmaking and divining rituals. 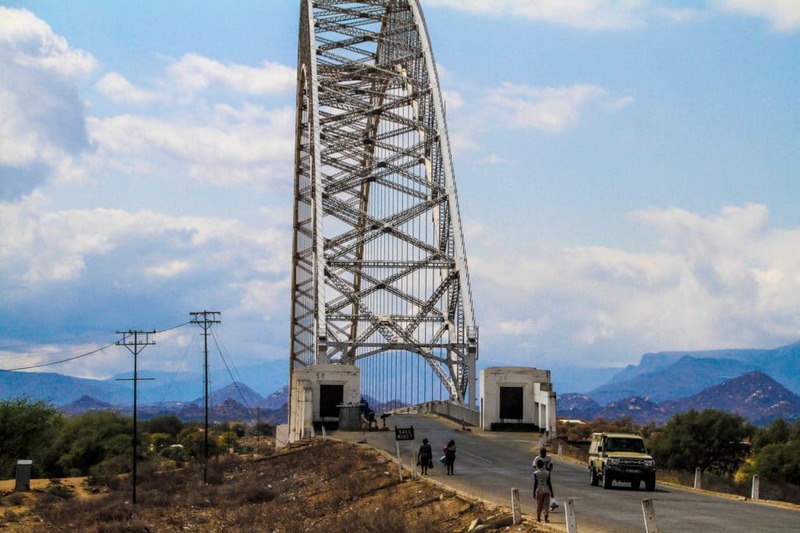 We approached Mutare from the south, on a fairly good tar road (some potholes), after a short detour to the famous Birchenough Bridge on the Masvingo road. The odd bridge is an exact scaled-down replica of Sydney Harbour Bridge, by the same designer. When the Save River is in flood, it rises up to 9m here and due to an unstable sandy riverbed, the only solution was a single-arch suspension design. In 1935, when it opened, the 329m-long bridge was the third-largest suspension bridge in the world. Just before Mutare’s central business district we turned right onto Bvumba Road; although poorly marked, we had set our GPS, loaded with Tracks4Africa GPS Maps, to Prince of Wales Viewpoint so we got it right first time. The viewpoint overlooks the bustling town, nestled in a gap in the mountains, and the even busier Forbes Border Post. Already then we realised with enormous disappointment that the cloud cover would prevent us from enjoying the renowned world-class views into Mozambique. A few talented artists were hard at work in the sculpture garden at the viewpoint; on display their sandstone handcarvings in a variety of styles. I could not resist the artistry and symbolism of a statuette called “The Lovers”, polished in part only, the woman’s dress in rough stone – a delightful memento for US$12! A right turn at the Burma Valley Road took us into a world where cosy, olde-English hotels, lodges and B&Bs still ply their trade, despite the dearth of tourism in this neck of the woods. 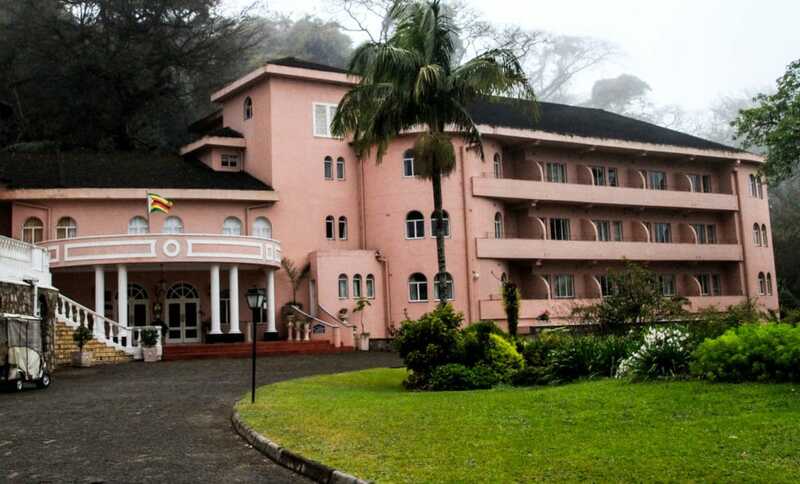 Business was rather quiet at the famous Leopard Rock Hotel and golf course, and although not dilapidated, the five-star lodge had certainly seen better days when Princess Diana visited, or when the Queen Mother said “there is nowhere more beautiful in Africa”. Vestiges of its oversized, glamorous past include a colossal crystal chandelier radiating light onto the double volume glazed wall that separates the lobby from its backdrop, a fern-clad boulder framing an enormous fig tree. The famous Leopard Rock Hotel. Vumba remains charming and genteel, even though commercial forestry, coffee and banana plantations have transformed parts of this naturalist’s paradise. 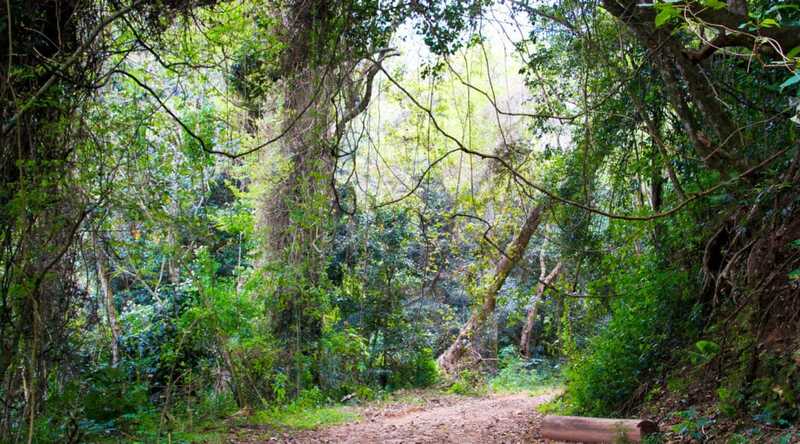 Much of the heavily-wooded habitat has been undisturbed by humans so it is a mecca for birders thanks to a coveted list of 14 forest specials headed by Swynnerton’s robin, bronzy sunbird, Roberts’s warbler and chirinda apalis. 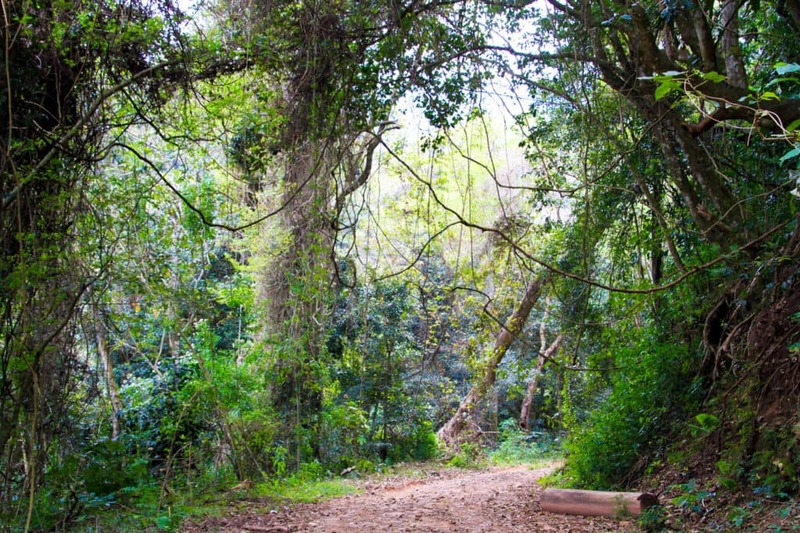 Some establishments have resident guides and walking trails through the indigenous forest in their own small private reserves. We relished a fleeting glimpse of Livingstone’s turaco, unmistakable due to its brilliant crimson wing feathers, as it glided between branches in the canopy. Camping in Zimbabwe’s Eastern Highlands. 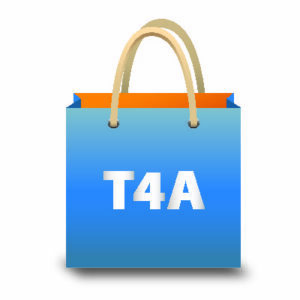 T4A directed us to the Botanical Gardens, once a showpiece attraction with 42 hectares of exotic gardens, now sadly run-down. The huge signboard at the entrance dates from a previous era when it featured visitor information about activities, facilities, opening and closing times – now no info whatsoever, suggesting that they do not really expect to see anyone pitch up. Masses of azaleas were in full bloom and we perked up, despite the drabness of dismal weather. 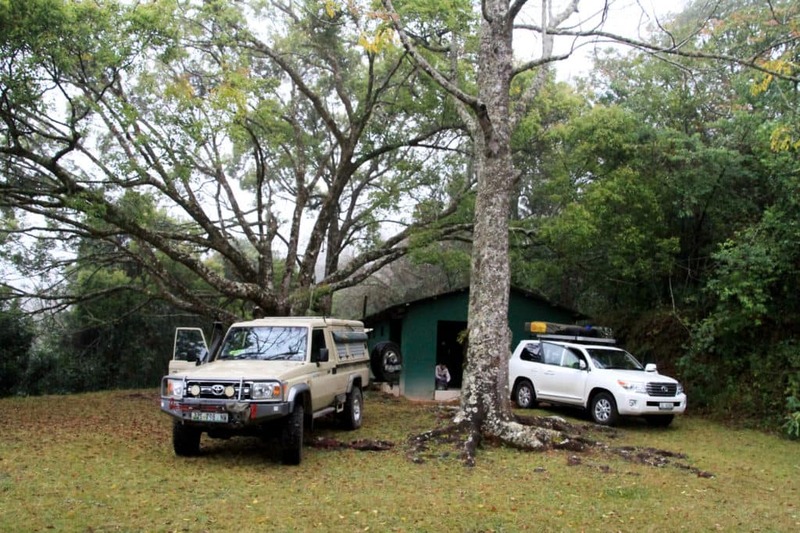 We had no complaints about the campsite which borders a vast indigenous bush; each stand has electricity, the shaded setting on lawn is wonderful, the braai areas and ablutions were neat, the huge donkey boiler was blazing away in no time and a wheelbarrow of firewood was delivered for our braai. 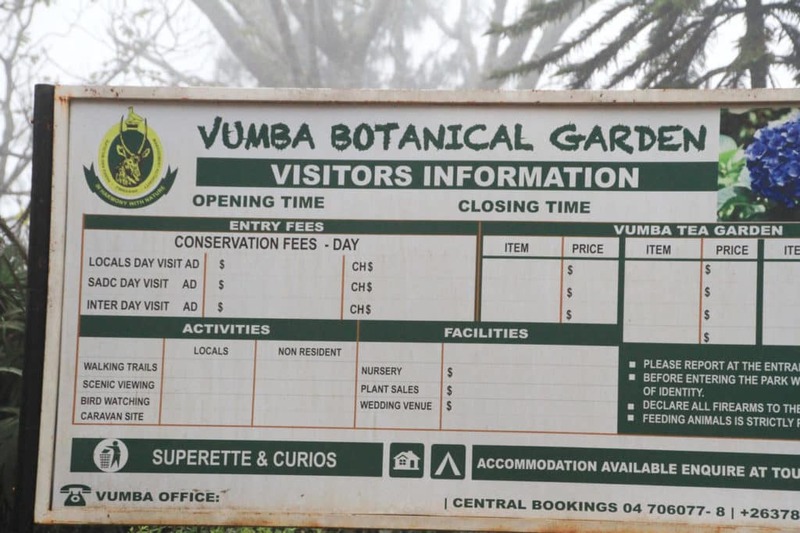 The sign at Vumba Botanical Gardens suggests few visitors frequent the gardens these days. 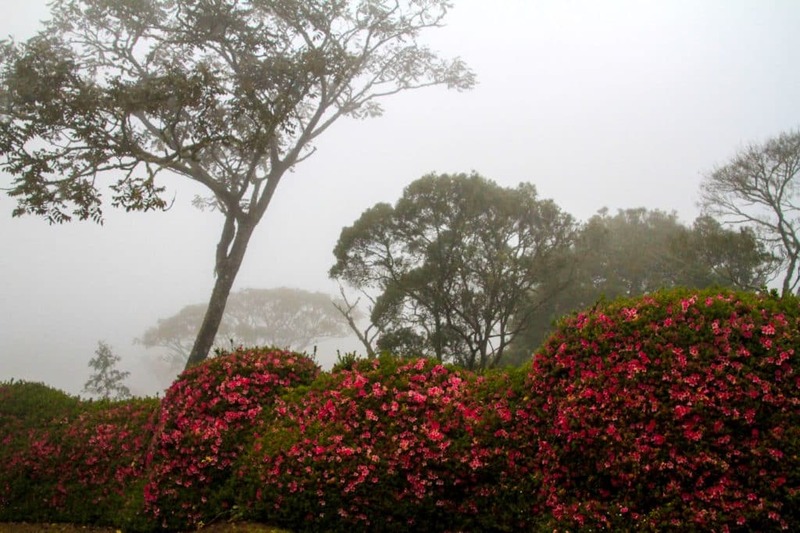 Azaleas in full bloom in the Vumba Botanical Gardens. 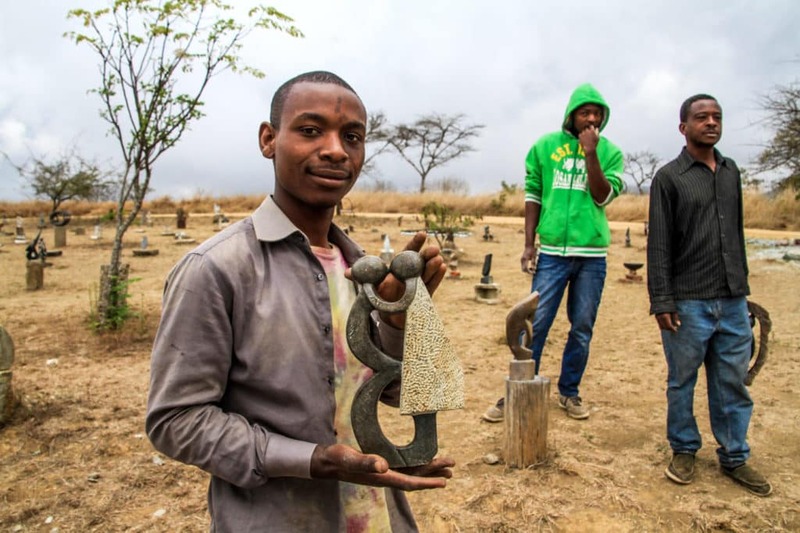 In our experience Zimbabweans are trying their utmost to make tourists feel welcome, even though they have to make do with very little themselves. We passed a lady selling embroidered tablecloths and cotton wraps by the Vumba wayside and couldn’t help but wonder when last she saw brisk trade. 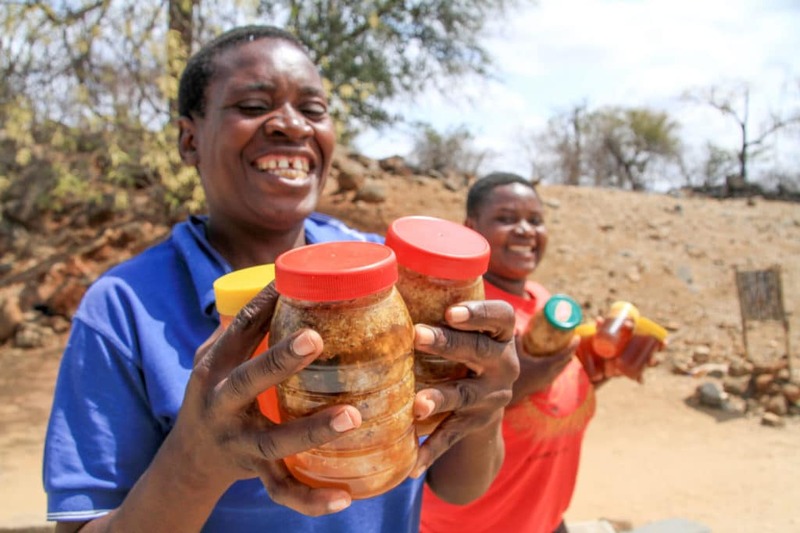 Elsewhere in Manicaland we had seen how excited locals were when tourists stopped for the wild honey they sold. Likewise, the crafters who make mats and carpets out of baobab bark fibre – these are very strong and tough but unlikely to find a spot in the crammed vehicles of overlanders and campers. Punted as Zimbabwe’s best-kept secret, Vumba features high on my must-see list. Adventurers, birders, hikers, botanists will relish the abundance of nature. It fully deserves to be one of Zimbabwe’s key tourist destinations.